RabbitMQ is a well known messaging broker. It gives a common platform for sending and receiving messages. RabbitMQ has some good tutorials in five programming languages. This post wants to show a little example about a message receiver likes a bridge between two message queues. Actually it’s very simple, the receiver send messages from the first messaging queue, after the processing of messages it sends them the second messaging queue. The first part is establishment of the first messaging queue and producer code sends messages to our message receiver (let be “worker”). This part is almost same as official tutorial. The second part is heart of our example, this part receives messages from the first queue and send it to the second queue. The worker code has two different queue definitions. And the final part is an ordinary receiver. Official tutorials are very helpful and simple, so in my opinion RabbitMQ is a simple tool for sending and receiving messages. I use it on different a producer machine, five worker machines and a saver machine. A good example to picture observer pattern is a newspaper subscription service with its publisher and subscribers. 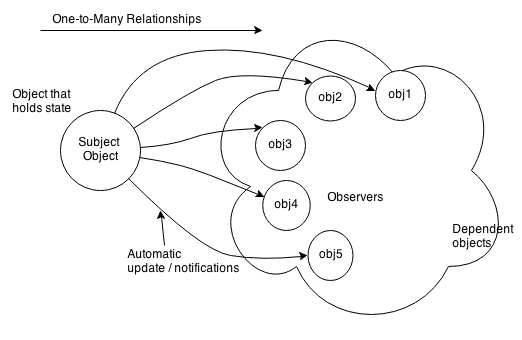 The observer pattern defines a one-to-many relationship between a set of objects. When the state of one object changes, all of its dependents are notified. A visualized example of observer pattern is below. I prepared a little example code of java observer pattern(*). The example acts like a tracker agent that it follows price and stock changes of a product. When price/stock information changes, all observers are updated new price/stock information. The code includes three interfaces. “Subject” interface which is subscription service. The others are “Observer” and “DisplayProduct”. * Notify all observers when the Subject's state has changed. * all observers have to implement the update() method. * It will be called when display product needs to be displayed. The code includes three classes. “Tracker” implements Subject interface that Tracker object is our subject object as above picture. One of the other classes is “FollowedProductDisplay” which is implements both of Observer and DisplayProduct interfaces. FollowedProductDisplay objects are our observers. System.out.println("Followed product: price -> "
The last class is “TrackerAgent” that it contains our subject and observer objects. (*) I get remarkable help from the book. Head First Design Patterns, Eric Freeman, Elisabeth Robson, Bert Bates, Kathy Sierra, O’Reilly Media, 2004.